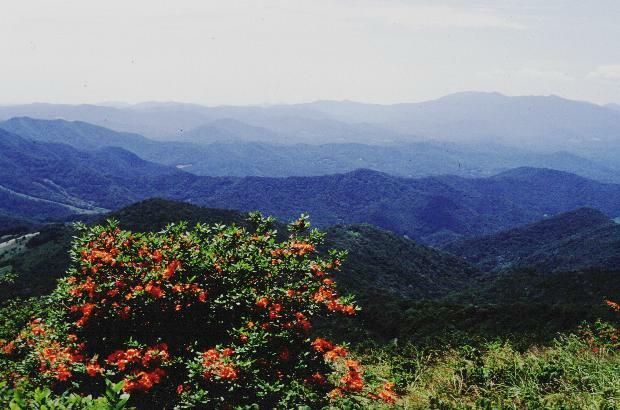 Probably the most beautiful place I have ever been is a stretch of the Appalacian Trail along the border of North Carolina and Tennessee near Roan Mountain and some of the highest peaks in the eastern United States. 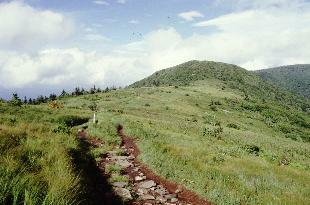 This section of the trail from Roan to Jane Bald and Grassy Ridge winds along the ridges at an altitude from 5000 feet to over 6000 feet through mostly open meadow. 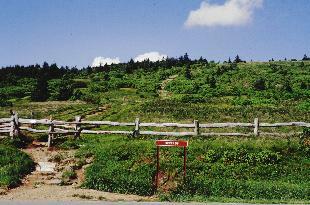 From the parking lot at Carver's Gap, the trail ascends approximately 1000 feet via log steps to the summit of Round Bald, elevation 5826 feet. 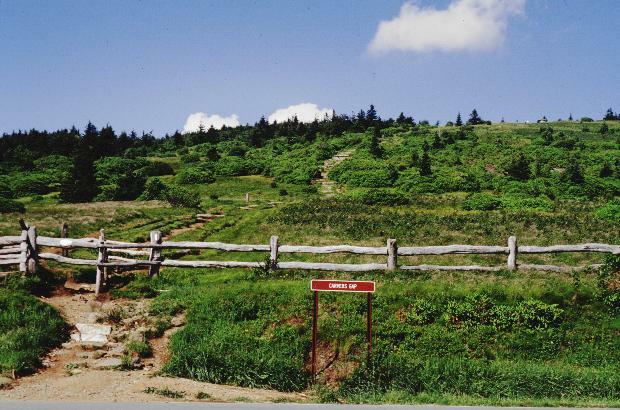 Although it doesn't look very steep from the parking area, half way up the incline it becomes very clear that one is gaining significant altitude. There is no need to rush the climb, though, because the slope is adorned with beautiful rhododendrons and azaleas, and the views of Roan High Bluff and the surrounding mountains are spectacular. 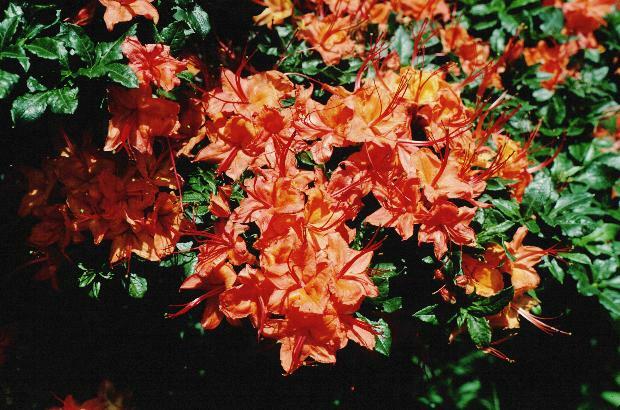 Scattered throughout the grassy meadow are beautiful specimens of the purple rhododendrons (R. catawbiense), a few flame azaleas (R. calendulaceum), occasional blooms of the rare Gray's Lily (Lilium grayi), many other wild flowers. At the top of Round Bald, the view is magnificent on a clear day. 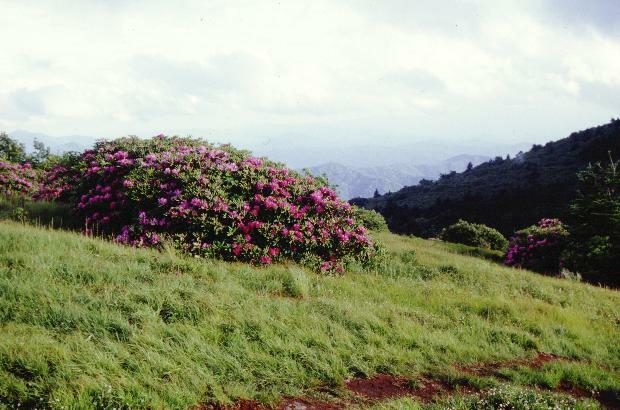 It reminds me of the opening to the movie "Sound of Music", except I don't remember Julie Andrews being surrounded by rhododendrons, azaleas, and such rare wildflowers. 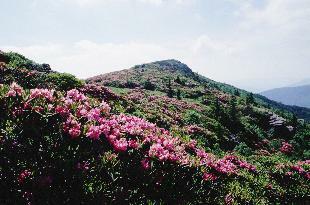 The Appalacian Trail in this area has been rerouted to help combat erosion, and as it descends to the right towards Engine Gap, the path winds through some spectacular displays of Rhododendron calendulaceum. One of my favorite plants there is a small yellow R. calendulaceum poised on the ridge. 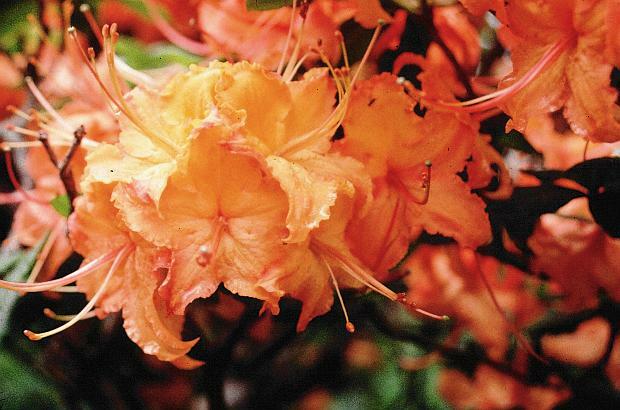 It provides a perfect photographic opportunity for anyone with a camera, and those of you who have traveled that path will surely recognize this plant in its setting. 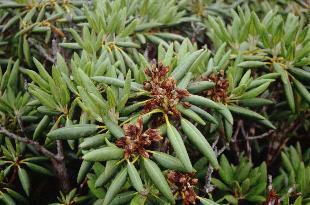 The trail continues on to Jane Bald, and more fine forms of R. calendulaceum. 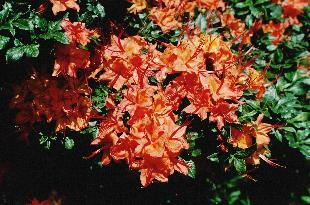 Over the bank near the summit of Jane Bald is another favorite plant, a brilliant orange and gold azalea we call "Molten Lava". The flowers of this clone are magnificently frilled and ruffled, measuring nearly two inches across. Unfortunately, the secondary growth of blackberries, vaccinium and alder in this area seems to be engulfing the falme azaleas as well as Gray's Lily. 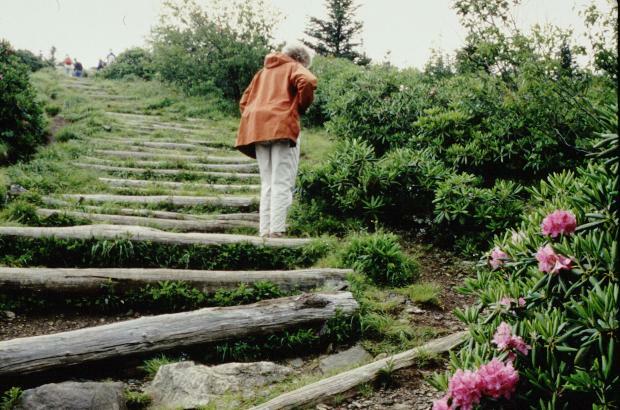 On each trip, we usually try to trample a path to our favorite plants and break back alder branches and blackberry stalks to give the azaleas and wildflowers another year of growth before they get overrun. We usually notice that others have already been there before we arrived, trying to assist these rare and endangered wildflowers. I have been concerned as to whether one should document these plants or try to keep them secret, because there are ruthless collectors who will raid and steal fine things. 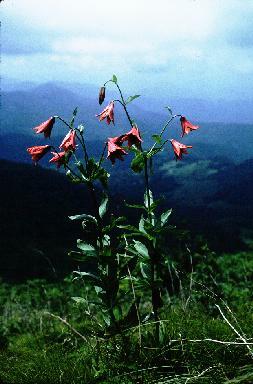 It was at Jane Bald that someone dug up this beautiful clump of Gray's Lily pictured to the right. 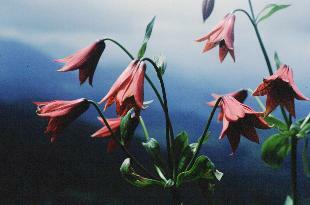 One of the bulbs disappeared after 1995, the other by June of 1997. 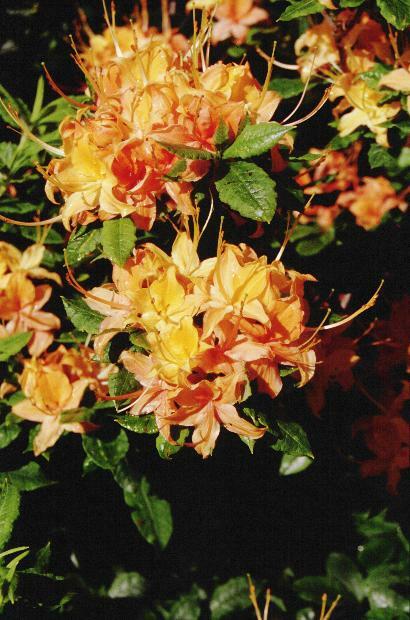 I have decided that it is probably better to raise awareness of theft of plants from the wild as a way to reduce those random acts that threaten the natural beauty that so many others enjoy. Whover took this plant did not dig up some insignificant red flower that would never be missed, but took a friend that many of us knew and loved. 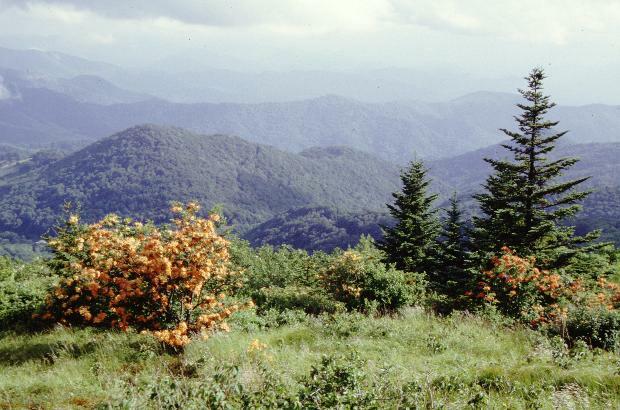 Unfortunately, there is another threat that could prove even worse than an admiring public, and that is the continuing explosion of the deer population. 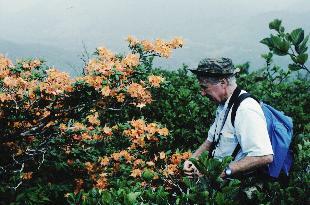 During my annual trek in of June 2000, I saw considerable deer browsing on the azaleas and rhododendrons. 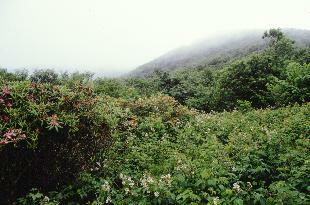 In many places, all foliage and most young plants under five feet had been completely defoliated. The buds on Gray's Lily had been eaten before they even had a chance to open which not only ruined the chance to appreciate the beauty of this endangered species, but also its chance to to reproduce by seed. Having seen what devastation this overpopulation has done to biological diversity in parts of Virginia, including my own farm in Amherst County, the potential for destruction in the next decade worries me greatly. 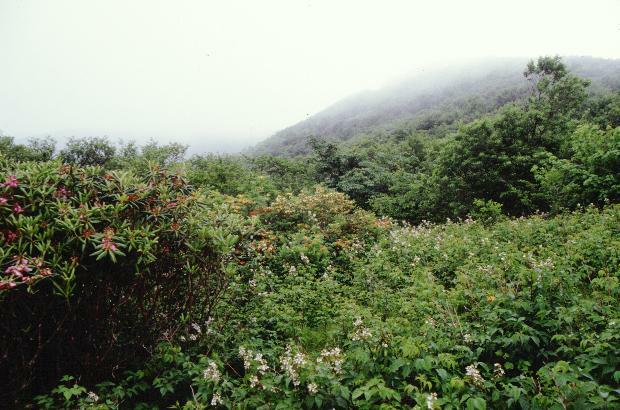 If only we could train deer to eat the encroaching vegetation rather than the rare plants, we could use them to our advantage. 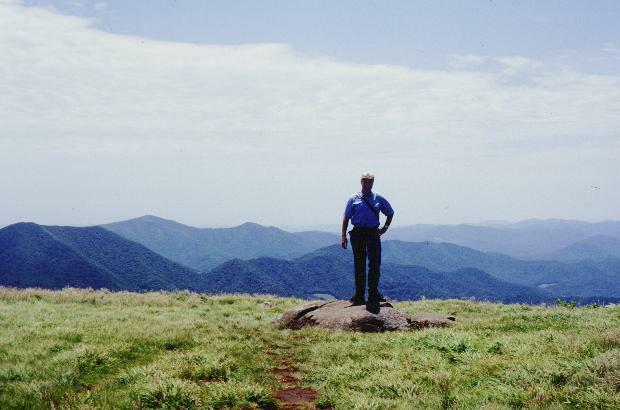 Beyond Jane Bald, the Appalacian Trail bears to the left, but we usually take a side trip out to Grassy Ridge so we can admire the views from its 6189 foot open summit. 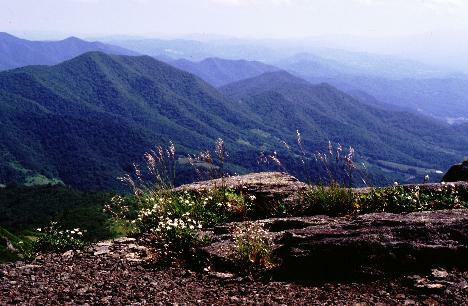 Masses of R. catawbiense cover the mountain tops in that area, but it wasn't until June of 2001 that I had a chance to see Roan Highlands in Peak Bloom. 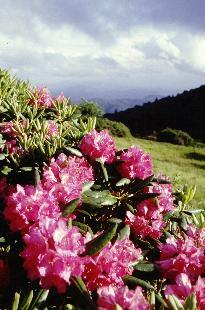 Prior to that time I had never seen that region when the rhododendrons were at their peak. On each trip I seemed to just miss the grand show for some reason or another. 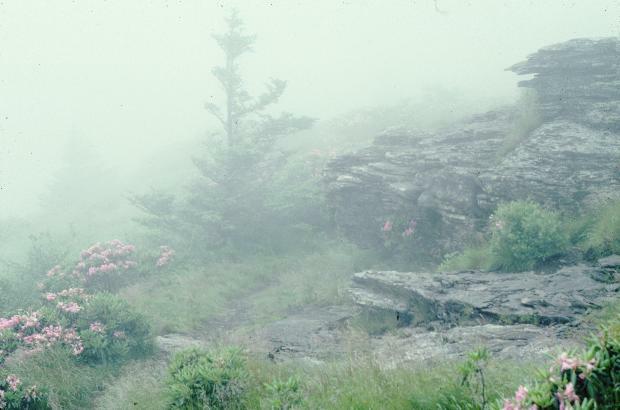 One time, the flowers seemed to be at peak condition but the fog was so thick that it was difficult to see more than 30 feet. Vistas of the mountains were completely obscured. Another time, a cool spring had delayed blooming so everything was in tight bud when I got there. I made the nine hour drive from my home back to the Roan Highlands a few weeks later, only to find that a hail storm had ripped the blossoms from their trusses the day before. In mid June of 2000, I was certain that I was on schedule. 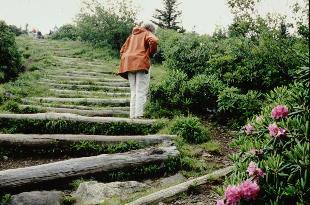 As I ascended the mountain, though, I realized that something was wrong. 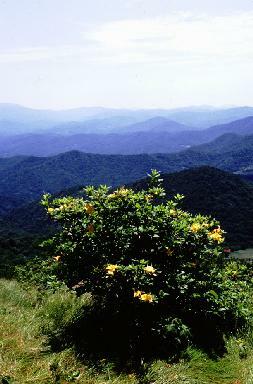 Apparently, when my garden in northern Virginia was experiencing a refreshing cool spell several weeks before, the eastern mountain tops at an elevation of 6000 feet had suffered a killing frost, damaging the flower buds just as they were expanding. Fortunately, the beauty of the Roan Highlands is under the watchful eye of various conservation groups, so it is not likely that uncontrolled development will desecrate the landscape. Now if we can keep eliminate destruction of the fine details brought on by inconsiderate people and hungry deer, this magificent scenery can continue to be one of the finest examples of nature's perfection.